When I was little, I thought that I hated lasagna, because I'd only ever had rather soggy versions full of watery, flavorless ricotta cheese. I couldn't understand Garfield's obsession with it. Now, a lasagna made with a good ricotta (a homemade ricotta, perhaps?) and other high-quality ingredients will, of course, be a different story, but ever since I first tasted the Northern Italian style of lasagna (popular in the Tuscany and Emilia-Romagna regions), lasagne alla bolognese, which is made with layers of meaty ragù, a simple besciamella white sauce and grated Parmigiano-Reggiano cheese, it has been my favorite kind. 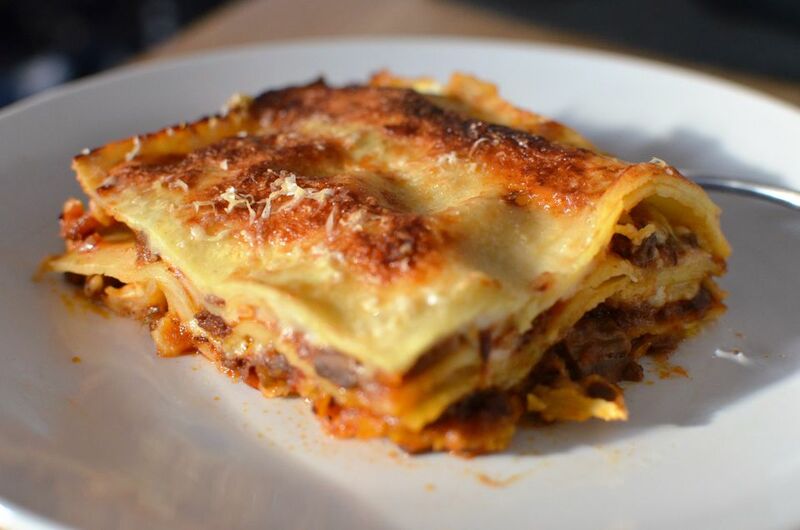 If you make a big pot of my Tuscan-style ragù on a Sunday, you can have it on some fresh tagliatelle (or another pasta) right away, and the next day use the leftover ragù to make this lovely, comforting lasagne. Prepare the besciamella sauce and your meat sauce of choice according to the recipes and instructions linked above. Cover the bottom of your lasagna pan with a thin, even layer of besciamella sauce. Cover the besciamella sauce with a layer of the lasagna noodles (you may overlap them slightly to make them fit, and/or cut them so they fit). Cover the noodles with another thin layer of besciamella sauce, then a layer of the meat sauce, then a generous sprinkling of the grated Parmigiano-Reggiano cheese. Then lay down another layer of the noodles, then besciamella, meat sauce, and grated cheese, and repeat: noodles, besciamella, meat sauce, grated cheese until you reach the top of your pan. Usually this will be between 4 to 6 layers. Bake for 20 to 30 minutes, or until the top is crisp and golden brown. If you have any leftover ragù sauce, it freezes very well. The lasagne can be made ahead of time and kept refrigerated and reheated in the oven, or assembled and frozen uncooked, then defrosted in the refrigerator for 24 hours before cooking.